I have very fond memories of my first visit to Brettenham. Back in 1999, on a hot summer day, we were driving a mazy way home from my wife's parents' house in Sudbury. The heat haze from the barley fields shimmered the narrow lanes round about. My two year old daughter was chattering away in the back of the car, her six year old brother exasperated by her relentlessness. Feeling it was time for a break, we stopped at Brettenham church, and stepped out into the warmth of the day. My daughter ran up the path to the porch, her fat little legs whirring ten to the dozen. She's now an elegant, sophisticated ten year old, and would certainly not thank me for recalling this. But the memory captures that day, and the day evokes a time in my life when so much began to fall into place. I was in my thirties. We were financially secure, we had two children, and we had recently moved to a house on the edge of Ipswich's beautiful Holywells Park. It was a time to be happy. Nearly a decade on, I am fortunate that not much has happened since to change that. I came back to Brettenham on a freezing, crystal clear afternoon in early February 2008. I don't mind admitting that my heart leapt within me as I wandered up the path. 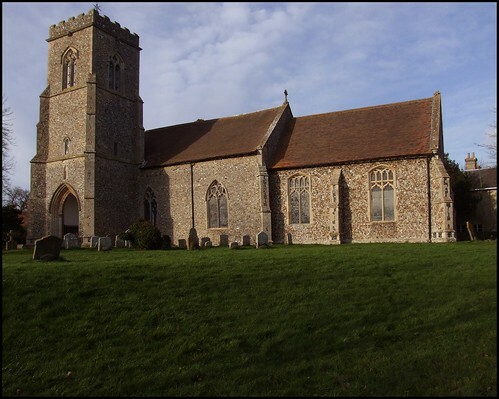 Externally, this is rather a jolly building, set among woods and hills in that great wild quadrilateral between Bury, Long Melford, Ipswich and Stowmarket. Unless you count Lavenham, this area is devoid of major roads and towns. Most of the villages seem to have characters of their own, as if this remoteness allowed them to get on with quiet but interesting lives. 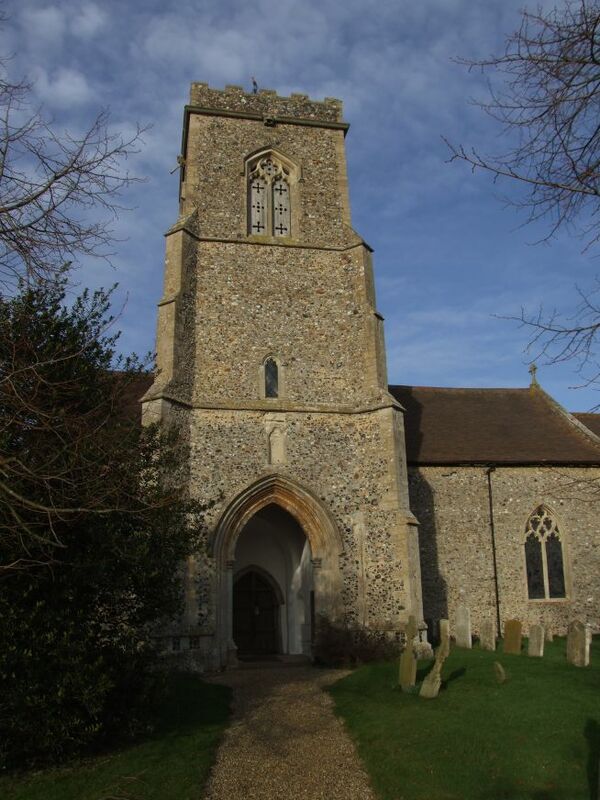 As with a number of churches in this part of Suffolk, the tower is built against the south side of the church, and you enter the building beneath the bells. Church bells were not rung in Britain throughout World War II, for the simple reason that they were being saved up as a warning of German invasion. We forget, now, how close they came to being rung for this purpose in the late summer of 1940. One imagines that the bellringers of Brettenham would have been more ready for this than most. Why? Well, another preparation for German invasion was the removal of placenames from roadsigns and railway stations, thus confusing an invading army. 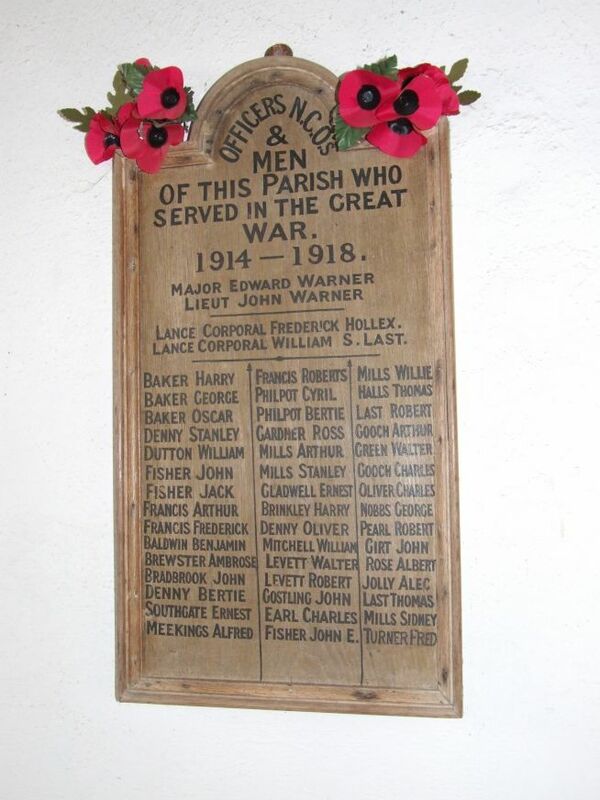 Signs were also removed from outside churches, but the parish here took this precaution one stage further, and obliterated the village name on the charity boards hanging at the west end of the church. No doubt Nazi determination would have crumbled in the face of such meticulous resistance, and it is good that the boards have not been restored, a fascinating relic of a terrible and uncertain time. Incidentally, the censors missed one mention - can you spot it? I had remembered the interior of St Mary as being gloomy and over-restored, but turning to the east now I thought I had been quite wrong. This is a typically lovely rural interior, a testimony to loving attention in the 19th and early 20th centuries, but not without earlier survivals. 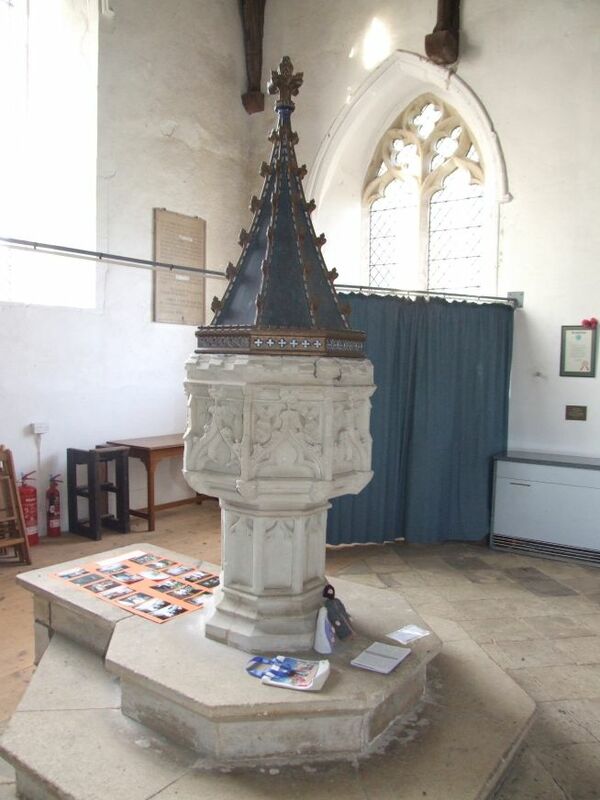 It can be attested from will-evidence that it's medieval dedication was to the Assumption of the Blessed Virgin, and from that time came the font with its elegant tracery. 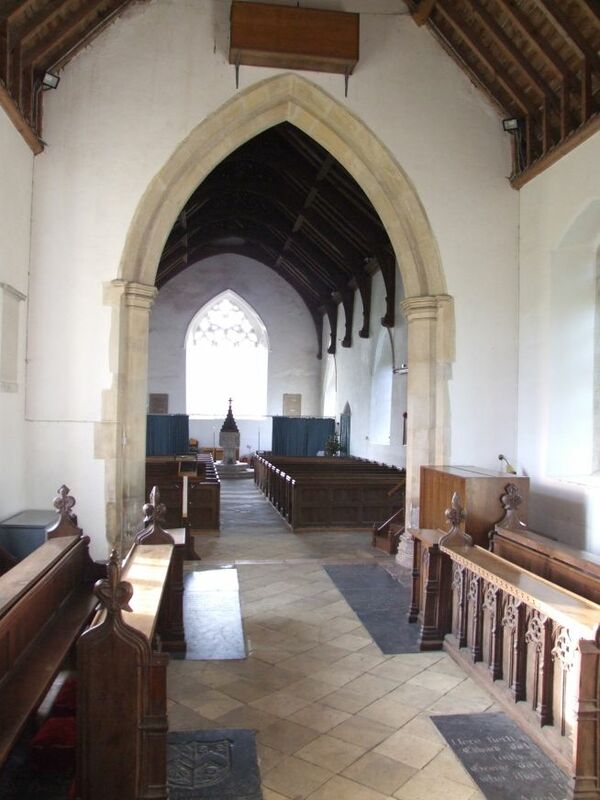 There are no aisles, but the nave is wide, and there is a feeling of space and light. What glass there is here is good and interesting. The oldest is in the north side of the chancel, medieval glass that looks 14th and 15th century, mostly assorted fragments but including a super shield of the Holy Trinity. The 19th century glass is mainly by Ward and Hughes, and much of it is elegant and characterful. 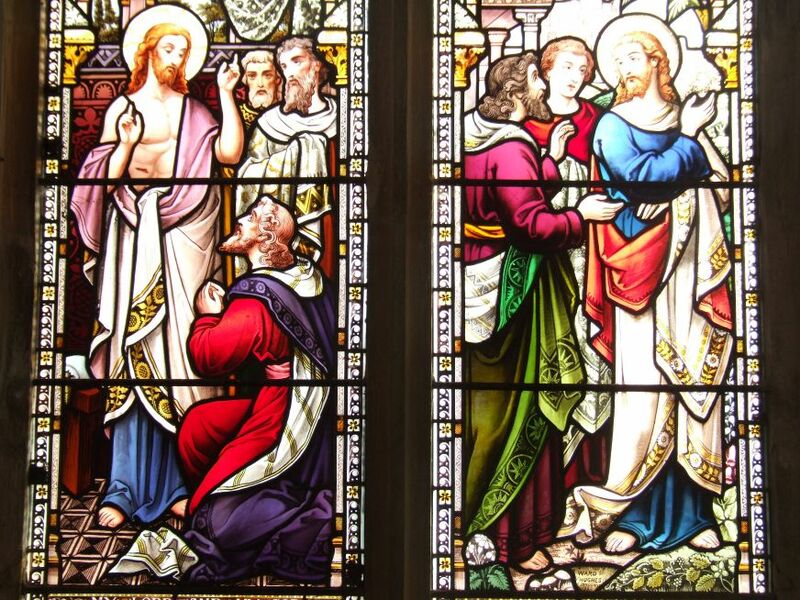 One depicts St Thomas encountering the Risen Christ. beside it, the scene of Christ with the travellers on the road to Emmaus is sprightly, although you can't help thinking that they should have recognised him. The crucifixion in the east window is atmospheric; the Art Nouveau murals either side of it chime a different mood, which is perhaps a little distracting. That on the south side also depicts the journey to Emmaus. 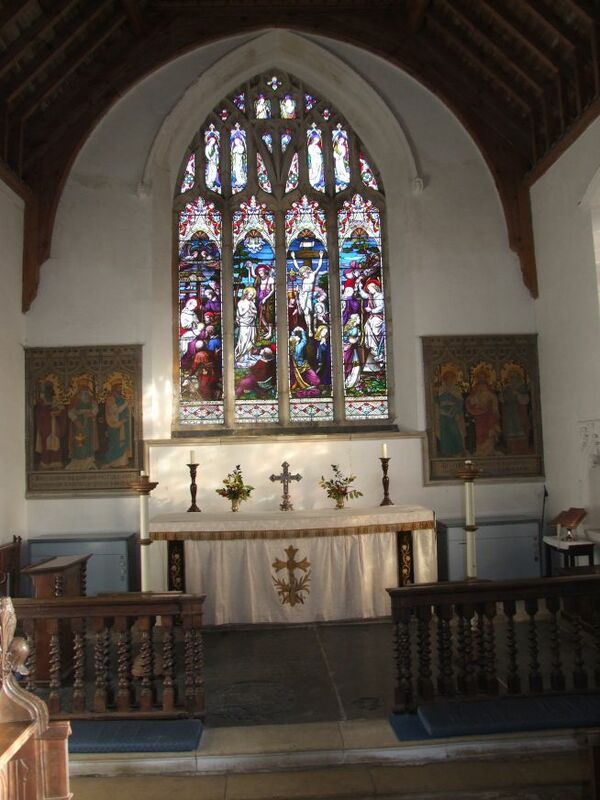 The best window is in the south side of the chancel, and depicts the Risen Christ. I suppose that it must date from the 1950s, and I would be fascinated to know who the artist was. Is it by Christopher Webb? The detail of Christ's feet, standing on tussocks of grass surrounded by spring flowers, is a delight. I wandered out into the winter light. It was only about half-past two, but already the sun was low in the sky. The shadows were lengthening, and the colours fading. I thought that I might just fit in one more church before photography became impossible, but before heading on to Buxhall I wandered around the quiet, open graveyard. I was pleased to make the discovery that Brettenham retains a large number of late 17th and early 18th century gravestones, fat as pillows with deeply cut skulls and cherubs. These former villagers wait patiently for Judgement Day in the quiet earth here, beneath the great tower they knew as well as we do. The churches around here are like well-fed cats, content and comfy in their villages. I felt I was in the presence of living, working communities; so unlike the commuter villages you find closer to towns. Wandering back towards the gate, I spotted several anthropomorphic head stones of the late 19th century, rather surreally cut in the shape of Teletubbies - now, there's something you don't see every day.